This together with the datastore represents two visits to this church. The first visit was to capture the memorial at the front of the church that faces the main road and any thing interesting on the outside. The panoramas and the inside shots were taken largely on the second visit. 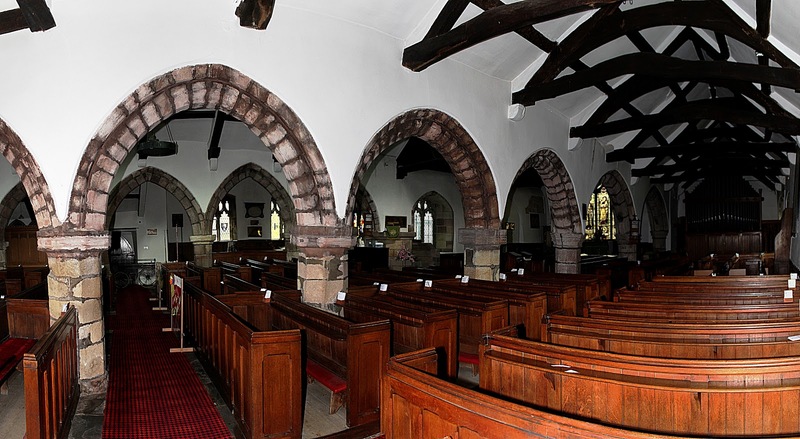 St Michaels sits roughly half way between the southern hills of the Pennines and the Fleetwood area. The next main town from on the main road is Garstang. Itself a town seeping with history. This page is most definitely a work in progress but for now some photographs. This has now been designated a class 1 listed building. Much of the history of the building can be found here. Looking towards the alter. This shot makes the Church look quite large. It really isn't. The light streaming in through the windows facing south adds an airy feel to the church. The river Wyre bridge. The memorial is just to the left. Completely taken by surprise - managed to get a shot off! From the rear of the church. The yew to the left and the sundial to the right. The panoramic effect makes the rail seem curved it isn't. However to the left of the main window is some of the original plasterwork that was painted. The modern yew tree avenue towards the west of the church. From the South entrance. Considering how small the church is - it is quite light. This is the South Aisle. Maybe to do with the white painted plaster. Restoration work is pretty good - it does not shriek at you. Well looked after, tidy church and a pleasure to be in. Soaking in history. There has been a church here since the 13th Century. A history of the building can be found here. There is no reason to doubt that there could have been a church of sorts here in the fifth century. Suspect it may have been of wood. (I have left out the names of the regiments. Many are not clear) I have corrected the alphabetical order. I think the panel at the front had been added later, the edges do not have quite the same rough profile as the vertical ones. It is possible to see where the lettering has been removed from the bottom of the WW1 stone. The words on the bottom appear to be the same. Grateful thanks to St.Michael's Historian Mr Albert Clayton who, many years ago, typed all Salisburyf family records for me. They were a key to my paternal family history, which has grown into a large family tree with many branches now. We loved the beautiful church wherein many of my ancestors had worshipped, as memorials and tombs there bore witness .valdalennie@gmail.com. Viewbank, Victoria Australia.